Figure personalities around the layout. George Breece. President, Breece Lumber Company. 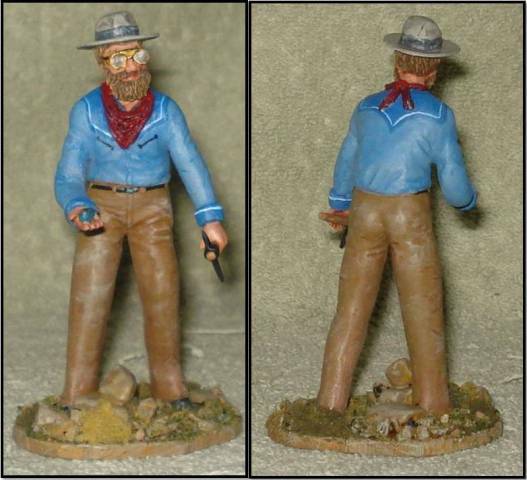 Unscrupulous businessman and chief nemesis of the Cibola Lumber and Mining Company. This is a Scale Humans figure with a custom head made by me. I have never been able to find a picture of Mr. Breece so I have assumed a rugged southwest look for him. Alexander Caldwell. Texas cattleman and livestock shipper. Another bad guy that the Cahill family has run across. He shows up on occasion to cause problems for the Mitford Livestock Company. This is a Scale Humans figure. One of the first multi-part kits that Rick has produced. Engine and other train crew. Ed Baczkiewicz, engineer on #50. Formerly with the Denver and Rio Grande, he was lured by the promise of the passenger train run from Santa Fe to Albuquerque to Farmington. He is the Cibola lines most experienced rod locomotive engineer. 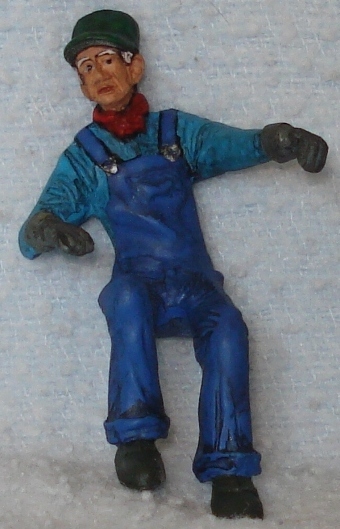 This figure is a Railway Avenue repaint. Ely Corning, fireman on #77. 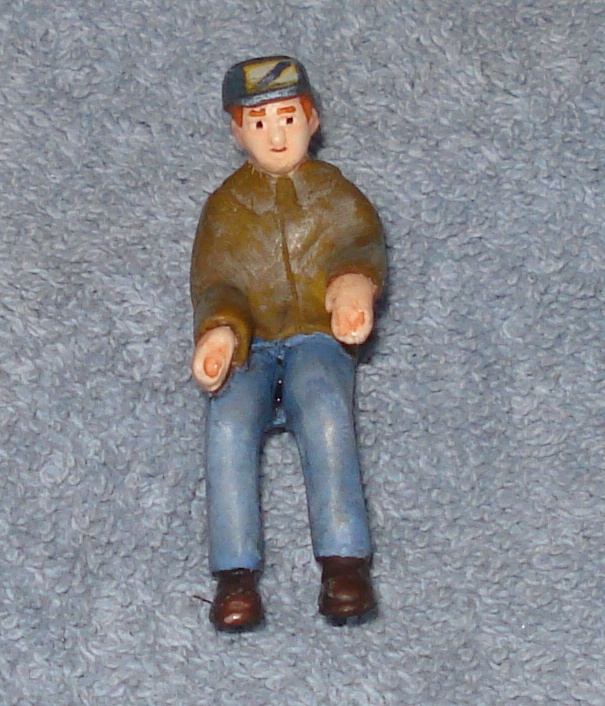 This figure is a Railroad Avenue repaint. Warren Smalley, engineer on #77. Warren has been with the lumber company since it was founded by Ian, Clayton and Jorge. He was the first engineer they hired and was originally assigned to #17. He is the most experienced gear locomotive engineer in the company. 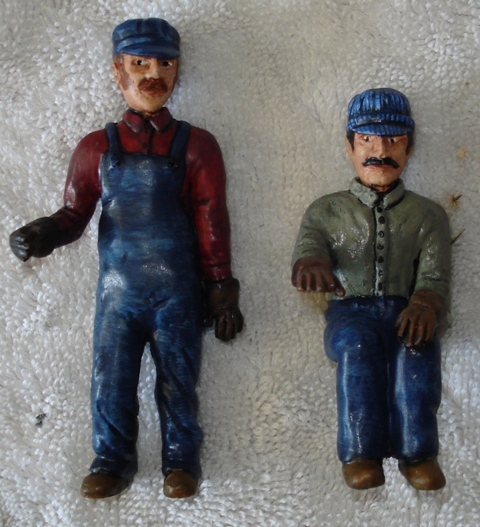 These figures are Railroad Avenue repaints. Bill Luxford, fireman on #5. Bill was originally running the boiler for the electric power plant at the Cibola Mining Company. He was hired on as firemen when the Carly-Jene #3 mine was opened and the rail line added. Bill Beck, engineer on #5. 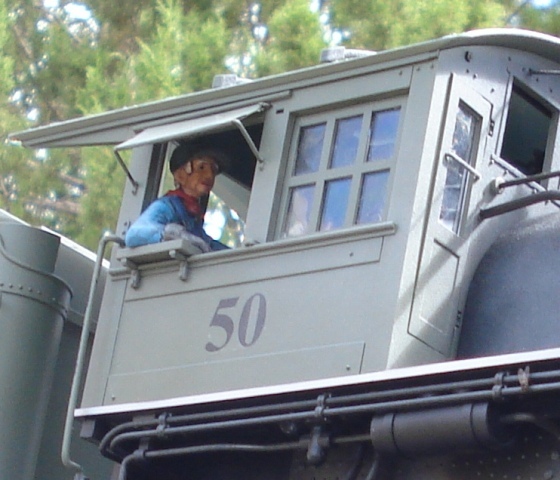 Bill was the first engineer hired for the mine train. He can on occasion be found in the engine shed helping with repairs as he is a first rate machinist. 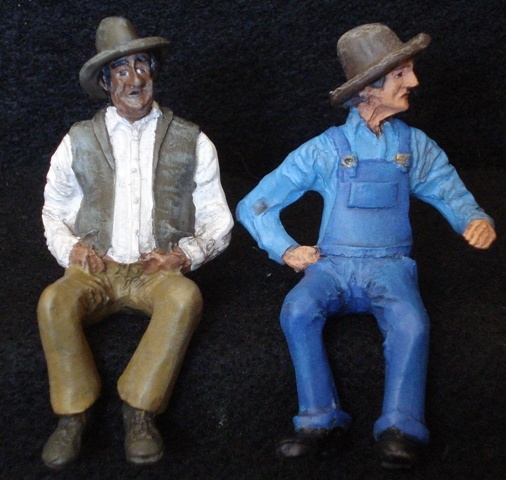 These figures are “Ed and Dana” made by Carlos Spirito (long out of production) actual crew for the D&RGW. Their faces were modeled by photographs of the real men. Passengers for coaches and stations. 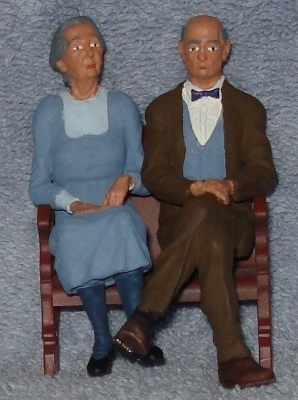 This is a pair of Scale Humans figures. More of Rick’s multi-part kits. They are meant to be waiting for their train at the station in Cibola. For now they do not represent anyone specific. Combine passengers. 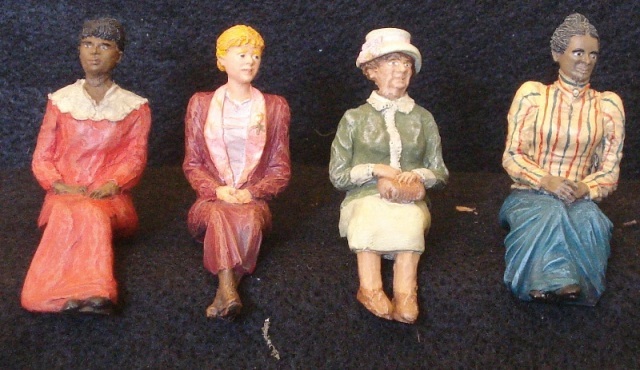 The first two pictures are repainted Railway Avenue figures. The second man has had his head turned to the side. 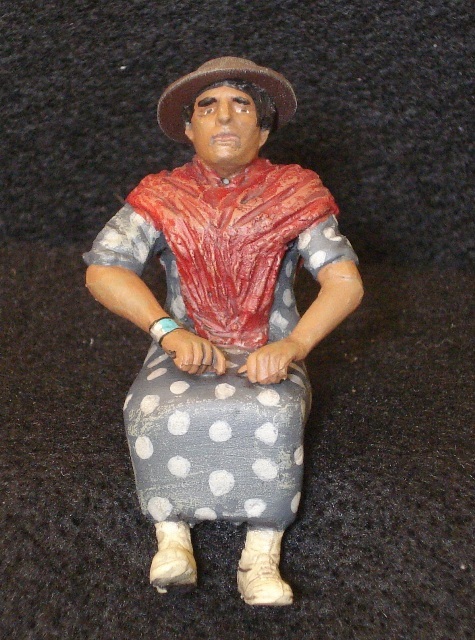 The Navajo woman is made by me from the Tamiya kits and SGP. She was inspired from this picture on a 1920’s postcard from Santa Fe. This is one of my favorite figures. made from the Tamiya kits and some bass wood. 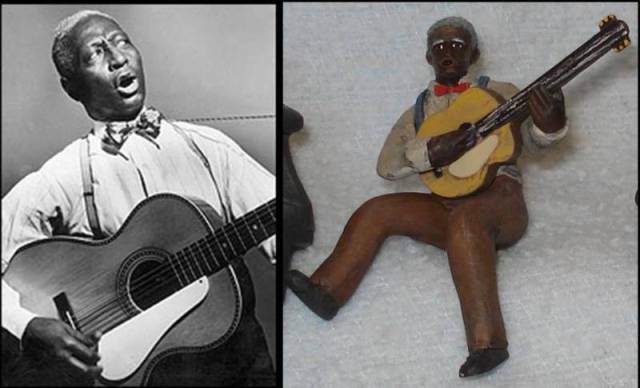 Huddie “Leadbelly” Ledbetter is playing his 12 string guitar for the folks to help pass the time. The figures in the group picture were all built to go in the combine. 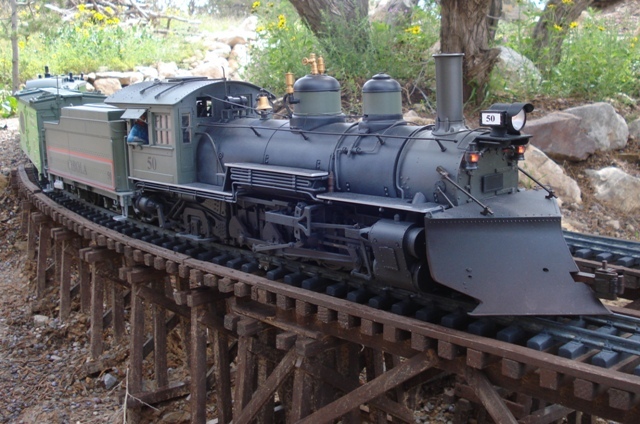 Top row: Tamiya kit (which was used in the coach) the Navajo woman, Railway Avenue repaint and another Tamiya kit figure with a Railway Avenue head. Bottom Row: Railway Avenue repaint, little boy made using a 1/30 mans body and 1/24th mans head from DIY figures bought from China, Railway Avenue figure with a Tamiya head, Tamiya kit figure and a Railway Avenue figure with the head from Woodland Scenics checker players. Coach passengers. 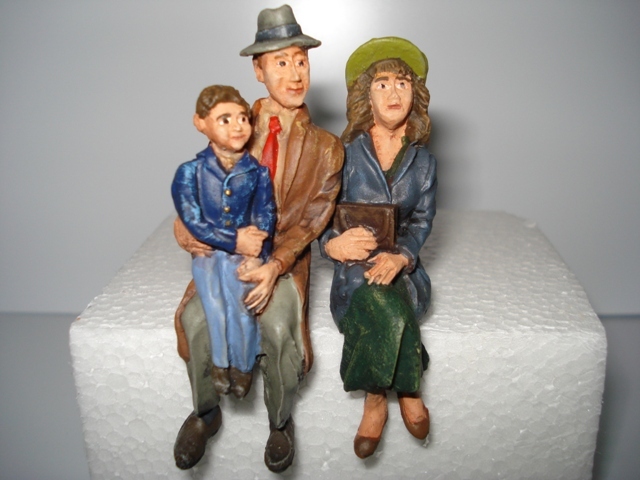 The family is made from woodland scenics figures. I added some two part epoxy putty to their butts to raise them up a little. They fit very well in the Accucraft seats and look good with the other figures do their large heads. The couple in the second row of pictures are all made by me and are original catings. The group of females is from Scale Humans. This is all of the sitting women, single mold figures Rick makes. 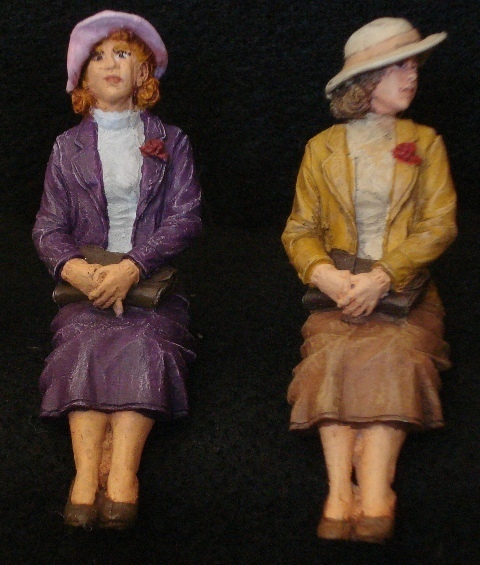 The ladies below are two different versions of Mrs Jenny from Fine Folks. I cut the head off of one and turned it a little to make them look less like clones. The purple dressed figure is in the coach the other will be used in the parlor car. 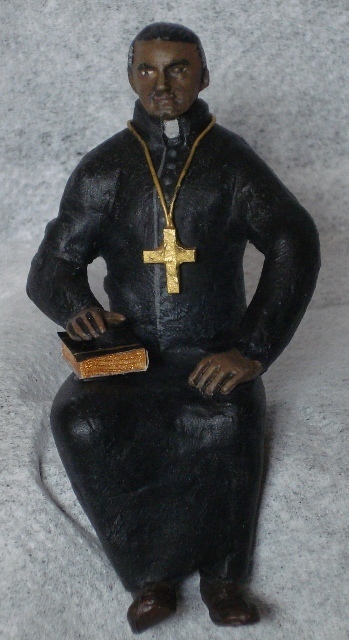 Father Juan Thomas. 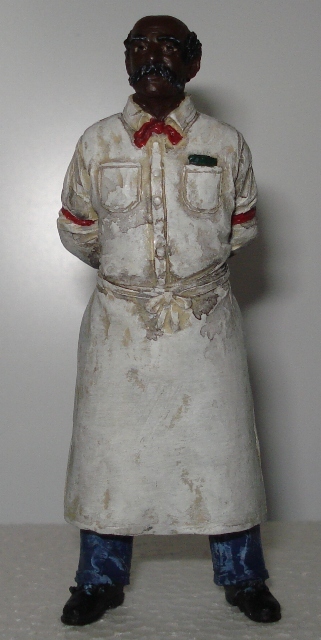 This 1920’s style Priest is made from the Tamiya kits using SGP. His Bible is a piece of styrene with the end scraped using a razor saw to make pages. The cover is masking tape painted black. Lots of detail that is impossible to see looking through the coach window. Parlor car passengers. 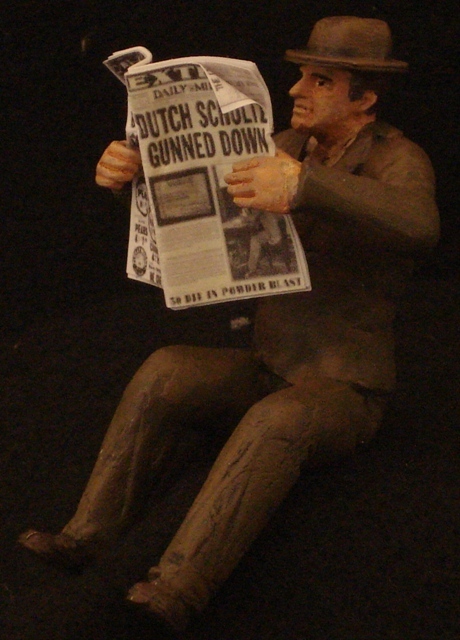 Newspaper reading man. Made from the Tamiya kits using SGP. His newspaper is made in power-point with six pages of 1936 articles and advertisements. He will be used in the parlor car. The bartender/steward in the parlor car. 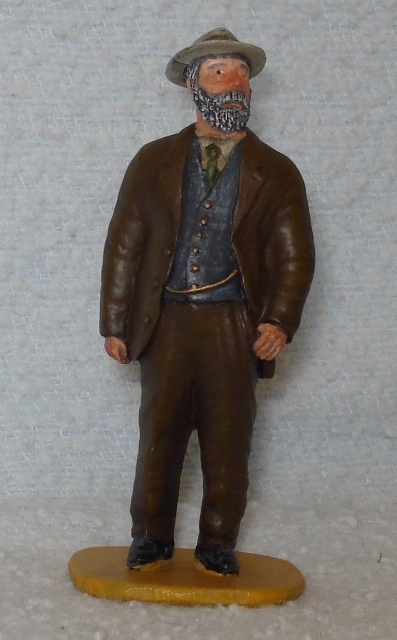 This is a Fine Folks figure sold as “Tony” the storekeeper. Figures made for friend’s layouts. These passengers were made for my buddy Ed Silos. He also acquired my original set of convicts.